When frequent flyers warmly advised us to take into consideration a review of Vietnam Airlines, we felt more curious than enthusiastic. Though this well-established airline shows reassuring security report, we expected nothing but shabby B767 with crampy seats, a socialist-style service like with China Airlines, and globally nothing comparable with the bonuses that companies from Southeast Asia or the Middle-East can procure to spoiled First Class and Business Class flyers. Our unfounded –or outdated- prejudices vanished with our impressive flight aboard the brand new Airbus A 350-900 operated by a totally revamped Vietnam Airlines, awarded 4-star by Skytrax, and well decided to engage swords with the competitors on the executive class segment. 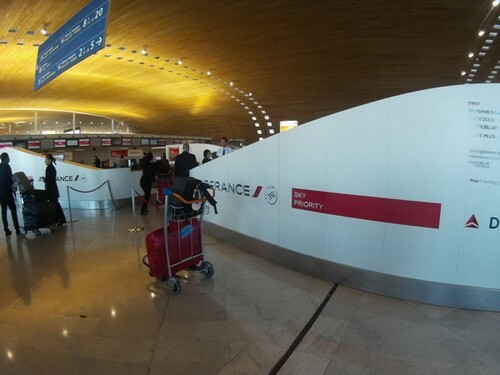 The experience started from Paris airport, Roissy-Charles De Gaulle 2E: a recent and comfortable terminal, with lots of facilities for the passengers… at least after check-in. 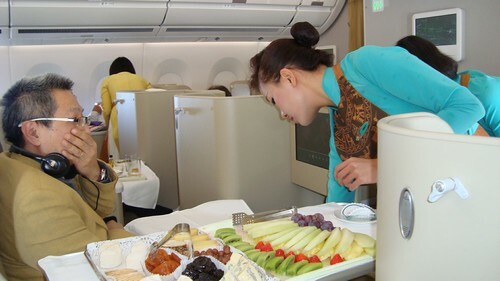 A hub for Air France – Sky Team (VN is a member of this alliance) , the Sky Priority for Business Class passengers by Sky Team staff was courteous; yet slow, and too much by-the-book when it comes to checking with 3 or 4 colleagues if you can stay in Vietnam 2 months …with a one year visa. The “fast track” for security check resulted in a long queue. Those were 45 long minutes in Purgatory, before reaching Paradise, which started with the quick transfer by shuttle line to Air France Lounge in zone S3. 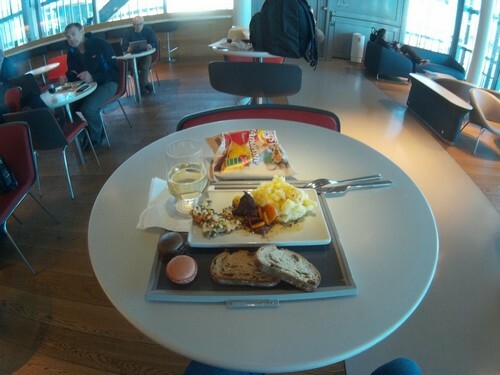 Surely one of the best business class lounges in Europe, with lots of space to relax, work or enjoy a fine quality buffet (coffee macaroons are yummy!) with a large selection of soft drinks, relatively good quality wines, and international liquors, it employs amazingly fair staff. We were positively surprised by the five-star quality of the service. A ravishing hostess checked our boarding pass, telling us that we would have enough time to enjoy the complimentary 15 minutes “Pre-Flight”, anti-jet-lag face-massage by Clarins, offered to all passengers transiting by the lounge. We followed her kind suggestion, and found this unexpected bonus beating in style the classic massages provided in some First Class lounges in Southeast Asia. 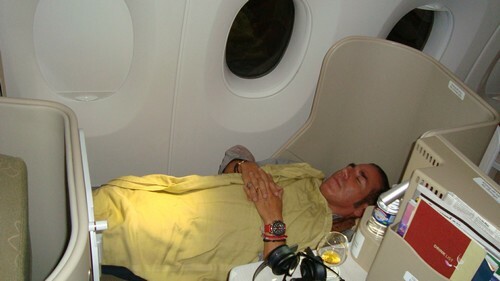 Thumbs up to Air France, and congratulation to Vietnam Airlines for treating its passengers in such a nice environment. The departing gate M 46 is located a five-minute slow walk from the lounge. 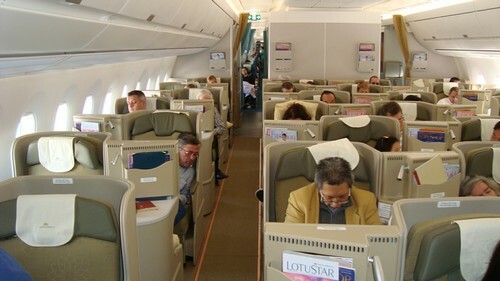 With lots of seats to accommodate all Economy, Premium, and Business class passengers. There is, of course, a separate boarding. The Airbus A350-900 parked imperiously in front of the gate, being shot like a movie star by a myriad of smartphone and cameras. Vietnam Airlines is the second airline (after Qatar Airways) to operate this aircraft. In 2016, more than 800 units have been ordered by more than 41 airlines around the world. Including 14 units for Vietnam Airlines in total. A competitor to the high-tech Boeing B787-9 Dreamliner (Vietnam Airlines operates 5 of them, with an order of another 19 units), the A350 is wider, lighter (constructed with composite materials), and can sit between 267 and 369 passengers, depending on the configuration and series. VN sits 305 passengers at ease in its A350-900 (29 in Business Class). 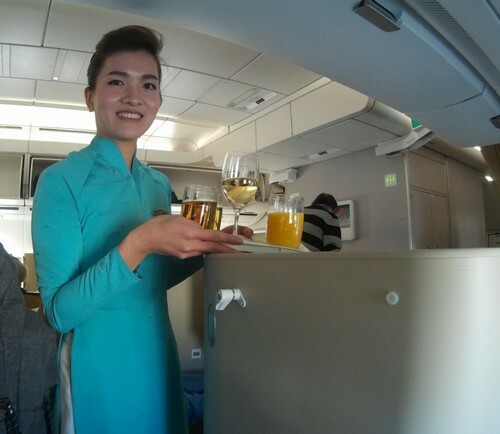 We entered directly into the Business Class cabin, greeted by smiling hostesses wearing blue and yellow Ao Dai: the ravishing Vietnamese traditional costume. Premium Economy and Economy class passengers use another access, and do not transfer via the aisle of the lovely, cozy cabin. We liked the neutral colors, innovative mood lightening, and 1 + 2 + 1 amazingly comfortable display of the seats. Meaning all passengers enjoy a direct access to the aisle. This route is code-shared with Air France… using (from Paris to Ho Chi Minh City only) a crampy and absurd 2 + 3 + 2 seats configuration. 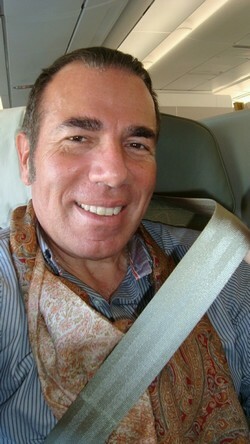 Clever flyers with a VN ticket avoid it by all means… and AF passengers often chose to fly VN! Last but not least, the luggage allowance is higher with VN: with up to 30 Kgs, plus two bags in the cabin. We got our jacket and pullovers transferred by the attendants to a cloakroom, before enjoying our large, deep, smooth seat, with so much space to spread our legs, use our laptop, and relax. We recommend window seats, giving the impression to fly first class. With no neighbor, settled in a five-star cocoon. All seats were occupied: the new VN Business Class sells itself like hot-cakes, with few upgrades available (even at extra cost). Advance booking is therefore recommended. After one glass of well chilled Champagne Heidsieck & Co, served with canapés, we took off right on time (2pm). Fastening our high-security seat belt around our waist, and also over our shoulder and chest. Like in a car. Once in the air, we removed the second belt. We found this little bit odd. That was the first time that we used this new technology, offering a double protection in case of rough weather or bumpy landing. We received another glass of Champagne, water, nice quality headphones, slippers, and an elegant Charriol amenity kits featuring all we needed for a fresh flight. The A350-900 cabin is so quiet that the air attendant whispered to enquire about our comfort, our drink and food order, or just pleasantly chatting with us. The air temperature is ideally fair. With enough moist to allow a normal breathing, and without that unpleasant impression of dry mouth which we usually get flying long haul. A350, like B787, is so technically advanced that you don’t realize that you are confined in a plane. We have been handed the menu with a glass of “Hello Vietnam” (Campari, Orange Juice and Sprite): a VN signature cocktail by Mister Vo Tan Si, President of Saigon Bartenders Association. A Paris palace-hotel barman couldn’t make it better. The selection also featured classics like Cuba Libre, Bloody Mary, and Dry Brandy Manhattan. Actually, the selection of aperitifs, spirits, and liqueurs was consequent in term of choice and quality. With popular brands of whiskeys and fine Cognac, rum Bacardi, Martini of course, and even Bailey’s Irish Cream. They do operate a full bar on board! Champagne was limited to Heidsieck, which partly paired our lunch fairly well. A fresh and tasty Salmon Canapé came with our cocktail, followed by a fragrant Chestnut Cream Soup. As a main dish, we could choose from meat (Beef Tournedos Charlemagne, Pork Cheek Confit), or fish (Marinated Codfish, Scallops). We selected the Scallops with Imperial Spicy Sauce, Sautéed Vegetables, and Steamed Rice. Excellent! The toasted garlic bread, soft Viennois bread, and olive/sesame mini baguette, tasted as fresh, textured and good as in a gastronomic restaurant. 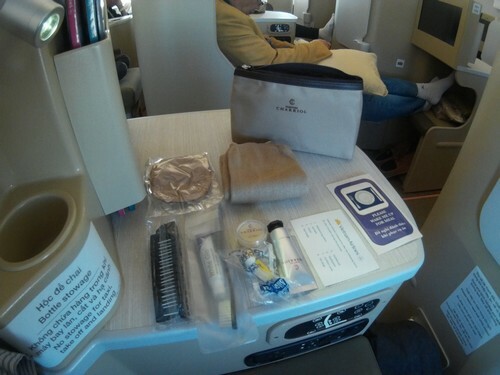 The stewardess suggested a glass of pale gold color, aromatic Burgundy, “Mâcon Péronne Chanson Bastion de L’Oratoire 2014”. We ordered a glass of an elegant and silky, red Bordeaux, “Château Grandes Versannes, Saint Emilion Grand Cru 2011”. Aristocratic, this was an ad hoc choice to pair our Fresh Vegetable Salad with a selection of fine cheese. We concluded this actually First Class lunch with a yummy Pecan Vanilla and Chocolate Ice Cream, prime quality “petits fours”, and an authentic Italian espresso. Plus one glass of Cognac Remy Martin VSOP, to calm down our excitement from enjoying such a nice flight, and totally relax during this non-stop flight. Skipping the excellent entertainment movie / TV series and music channels, we slept in the arms of Morpheus over the long and wide 180° Sogerma Solstys full flatbed. 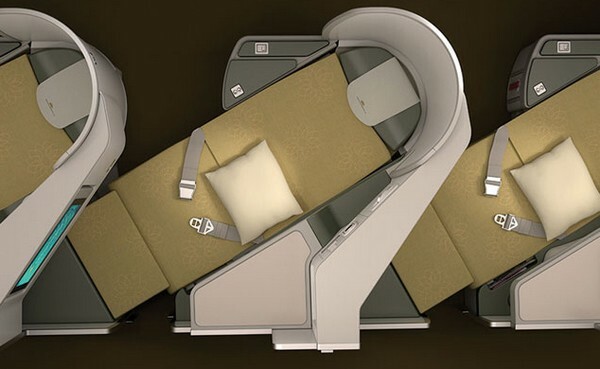 Those who have flown with Emirates or Etihad will be familiar with the design. We opened our eyes from time to time, checking our position over the map. We saw the flight attendants walking throw the aisle regularly, checking if everything was OK with our comfort and offering water or juice. 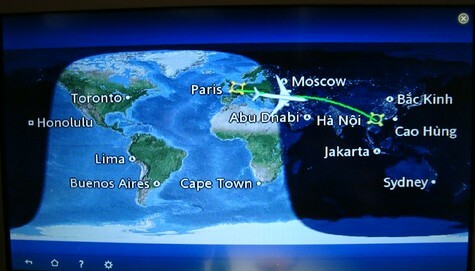 Like five-star nannies, kindly anticipated all our needs from Paris to Hanoi. 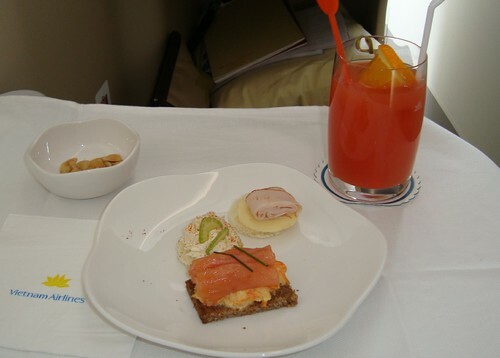 A couple of hours before landing, a rich breakfast was served, featuring standards, like cereals, yogurt, freshly baked mini croissants and raisin bread, but also signature main courses like Cheese Soufflé with Poultry Sausage, Spicy Tomato Sauce, and Fried Potato. Some more gastronomic dishes are also available: Fried Codfish, with Black Bean Sauce, Friend Rice, Sweet Bell Peppers was fine. We liked very much the yummy Pear Caramelized Double Crepe, with Strawberry Compote, and Sugared Mascarpone. We landed smoothly, and on time (6:20 am), at Saigon Noi Bai International Airport, Terminal 2, with a priority exit procedure for Business Class passengers. Vietnam Airlines still doesn’t provide WiFi aboard of its long-haul flights. The project is still under consideration, and a charge should apply for the connection. Even for Business Class passengers. That was the one and only and only think missing. Though it didn't matter to us, it does to business people. Vietnam Airlines improved so much in only a couple of years. And still works hard on reaching the top-end quality in term of security, comfort, and service. Emirates, Etihad and Singapore Airlines have found a new, aggressive competitor. 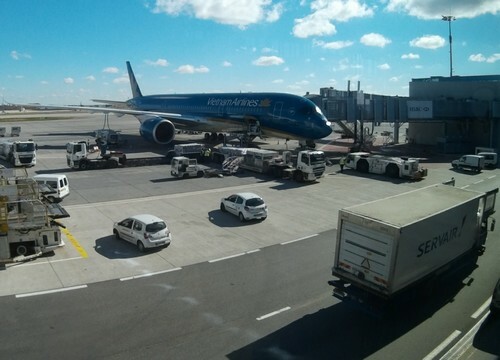 VN operates direct flights from Hanoi Noi Bai, and the larger Saigon Than Son Nhat airport, to the leading destinations around the world, and to an increasing number of destinations in Vietnam and the rest of Asia.